Stay inspired! Sign up to follow my blog and get my slipcover tips, resources and news. What exactly is oatmeal fabric? 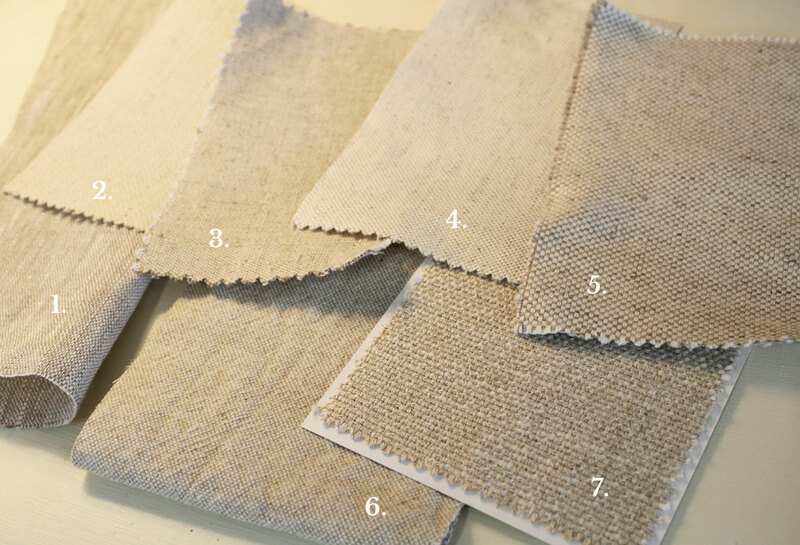 It’s a cotton-linen blend, or poly-linen, woven with two colors: natural and undyed flax. Most oatmeals take on a grainy texture and rustic appearance after washed. The flecked cloth is a versatile alternative to solid neutrals such as natural and beige. Cypress from InstaLinen. A light weight 100% linen in a gray-tone oatmeal color. Too light for slipcovers but works beautifully for other home decor projects: shade valances (shown above), kitchen towels, pillow covers, lamp shades, curtain panels and more. Linen Slub from Big Duck Canvas. A textured 14 oz. polyester-linen blend. Latin from InstaLinen. This medium weight cotton-linen blend has a rustic, grainy appearance and works well for slipcovers that get moderate use. Vintage Linen Blend from Big Duck Canvas. A soft 12 oz. linen-cotton with a subtle fleck. Cotton Linen Blend from Big Duck Canvas. A pronounced basketweave with a soft hand. Boyd Natural from Calico Corners. 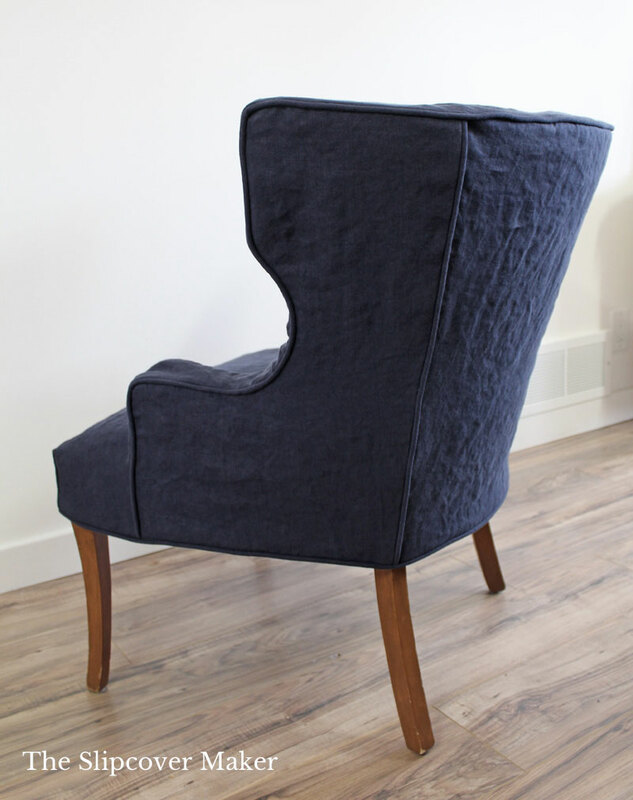 I used this fabric for the chair slipcover shown above. It’s a medium weight cotton-linen blend that takes on a rustic texture after washed. Washed Grainsack from Pottery Barn. No longer available. You can find affordable used furniture at Habitat for Humanity ReStore. Chairs and sofas in good shape just waiting for a slipcover makeover. This medium weight, tightly woven chino twill is a good option for making slipcovers when your home sewing machine can’t stitch through thick denim. Big Duck’s #12 weight canvas is different than 12 oz. canvas. Both work for slipcovers but #12 weight is made with 2-ply yarns, which means it’s more durable and less grainy. Don’t judge fabric by the price. Fabric priced at $25 per yard isn’t necessarily a better choice for slipcovers than a $10 fabric. 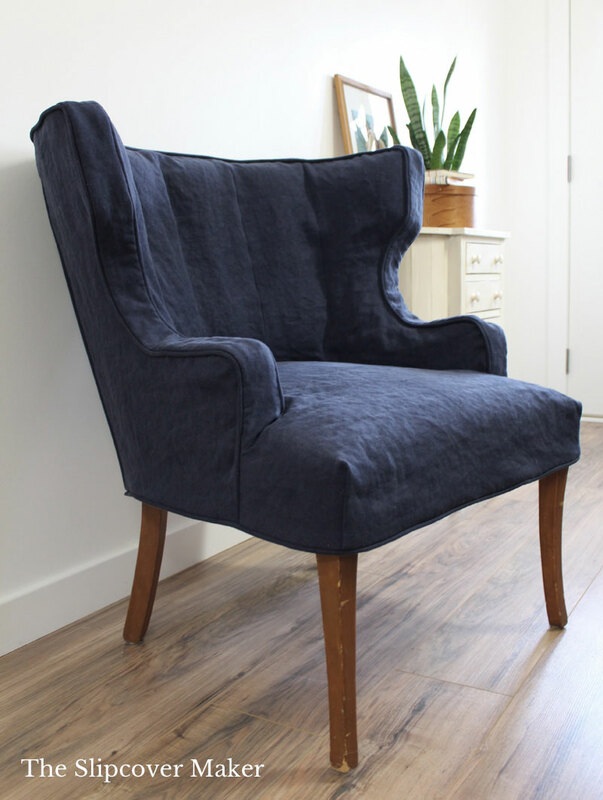 Just as a $5 fabric isn’t really a steal if it pills, shrinks-up or stretches out soon after you start using your slipcover. Shop smart. Buy a one yard cut to test shrinkage, coverage and durability before you commit to yardage. This month I’m celebrating my 6th year in business and a move to my new workroom here in Michigan! I’m now tucked into a small, efficient live/work space with lots of natural light, wood floors and nature views. No commute and less stuff to manage. Yay! 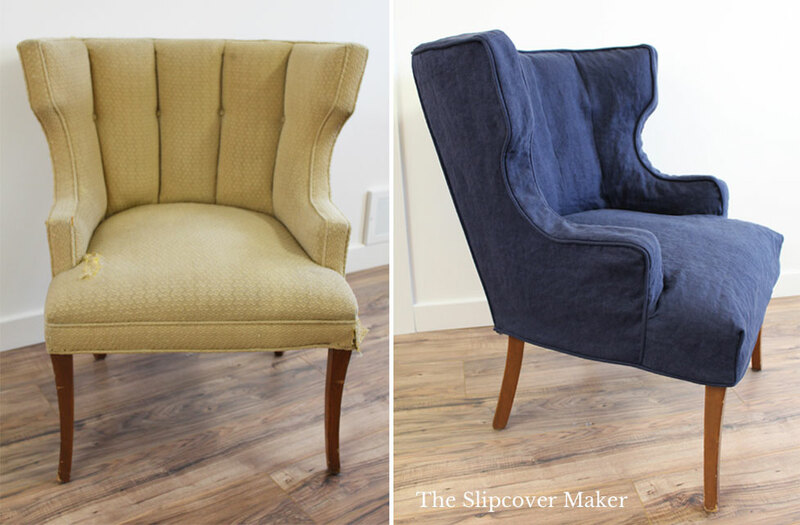 I’m looking forward to sharing more slipcover makeovers with you from my little creative spot. This entry was posted in linen, newsletter, slipcover fabrics, Uncategorized on April 9, 2018 by slipcovermaker. Today I added a gorgeous new color to my list of favorites from Insta Linen’s Brazil Linen collection. It’s color Blue 5. This grayish-blue shade is a soft slate color that can easily be used as a versatile neutral. It’s a very pretty alternative to classic grey. I love how Blue 5 works with my customer’s hardwood floors, white walls and beige home furnishings! Brazil Linen looks best when it’s pre-washed and styled in a relaxed, tailored slipcover. A softy crumpled texture and casual vibe are part of it’s charm and natural beauty. For more linen slipcover inspiration, check out this pair of Quatrine slipcover copies in Brazil White and a simple cover for a wingback chair in Brazil Off White. 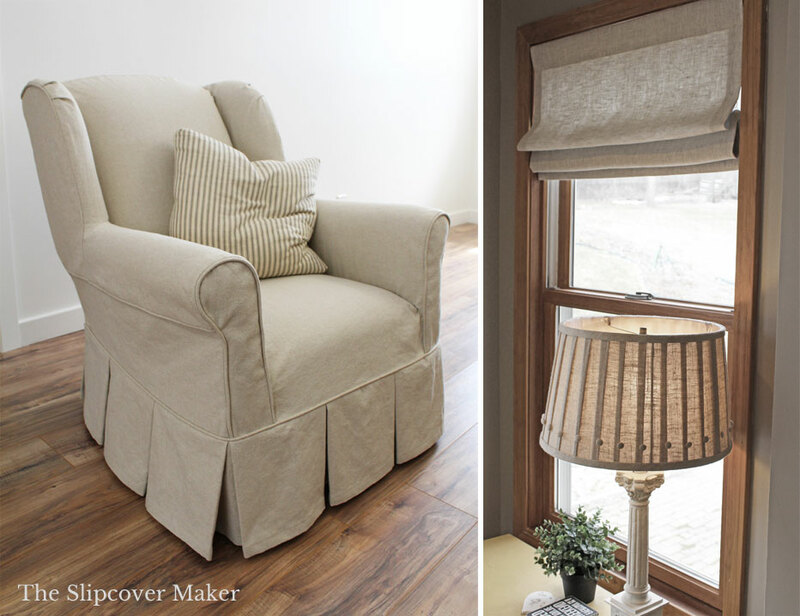 This entry was posted in armchair slipcovers, linen, slipcover fabrics and tagged custom slipcover, linen slipcovers on August 15, 2017 by slipcovermaker.